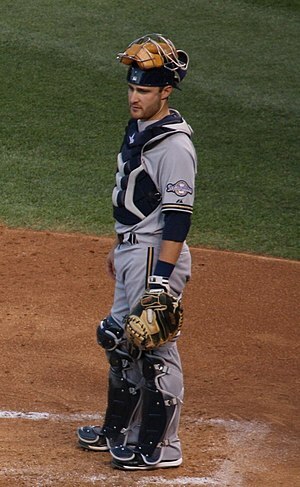 Brewers catcher Jonathan Lucroy had a pair of RBIs last night in the team’s 9-3 win over the Cubs. Those RBIs give Lucroy 42 for the season, which places him first on the team in that category. In looking at the Brewers history, there has been only one Brewers catcher who has led the team in RBIs in a season. Dave Nilsson did it in 1994 when he had 69 RBIs. If Lucroy maintains this pace, he could become the second backstop to lead the team in runs batted in. Lucroy has 42 RBI in 64 games played. The Brewers have 87 games left on their schedule, and should Lucroy play in all 87 games (not likely) he is on a pace to drive in 99 for the season. Only one Brewers catcher has ever driven in 100 or more runs in a season; that was Ted Simmons in 1983 when he had 108 RBI while catching in 86 of 152 games that season. Note: Through games of June 25, Lucroy ranks tied for second in the majors for catchers with 42 RBI (he is tied with Cards’ catcher Yadier Molina). Buster Posey leads all MLB catchers with 43 RBIs.